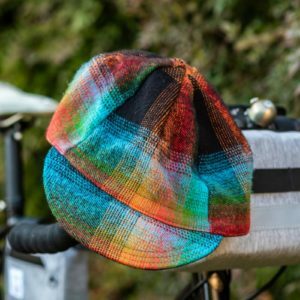 • The Sweetheart winter cycling cap is the cap to grab as you head out into a blustery cold day with your bike. 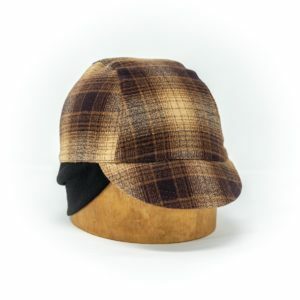 The cozy flannel fabric and knit ear flap (that can also flip up) will keep you nice and toasty! 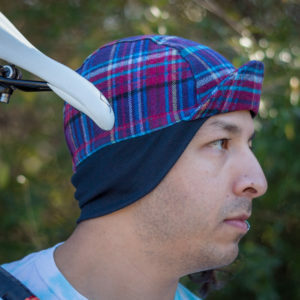 Whether you’re trying to keep your head warm, keep sweat from dripping in your eyes, or hide that helmet hair, these cycling caps will fit the “bill”. These gorgeous little babies were loving created, and agonizingly perfected, to meet a very high standard of quality. Our cycling caps were tested, tested, and tested some more in over 103 degrees Fahrenheit in the amazing city of Dallas, Texas. 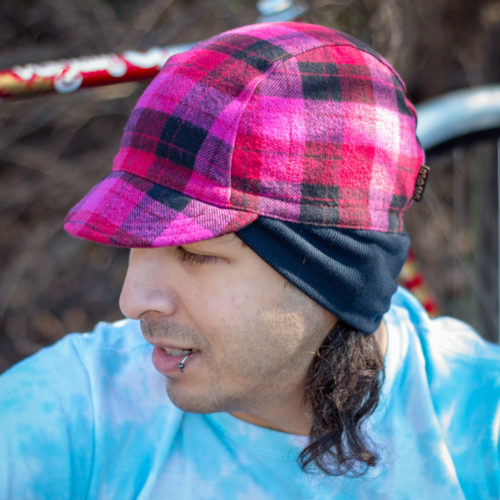 • This cap features a double brushed cotton Flannel fabric in Pink, Red, Black throughout the cap, and with a black knit ear flap. • All top stitching is in a Red polyester thread that matches the fabric. • Inside you will find a soft and durable black cotton twill tape band with an elastic section to keep the cap from flying off of your head while you’re riding down the trail. • No need to worry that your bill will break because a flexible polyester material was used to prevent that problem! 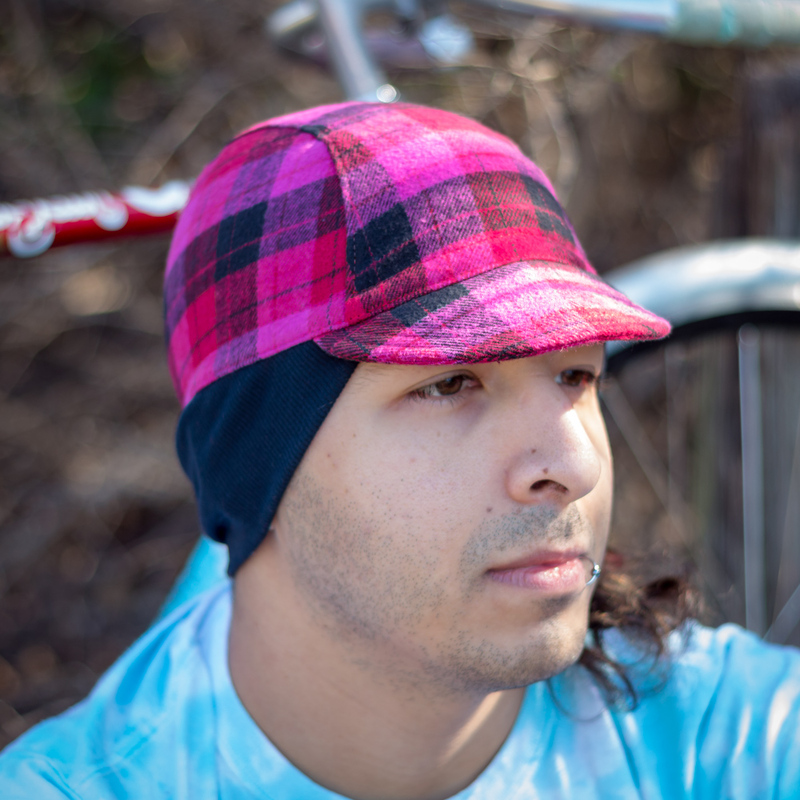 • The Sweetheart winter cycling cap is built in our three panel design with a vintage bill. To keep your fantastic little cap in great condition it is suggested to hand wash with a mild detergent in cold water, and hang/lay flat to dry. All of our caps have been pre-shrunk so you should not experience any shrinkage! *If your bill does become bent, you can use a steam iron to help press back into place. However, it is still suggested not to bend your bill intentionally. Unless you want to! **It is always best to measure your head with a flexible measuring tape over your hair to ensure you get the best size for you! 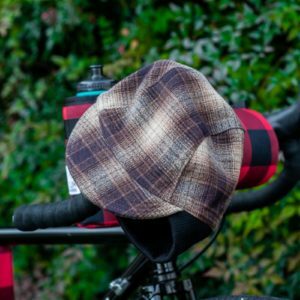 • The Affogato winter cycling cap is the cap to grab as you head out into a blustery cold day with your bike. 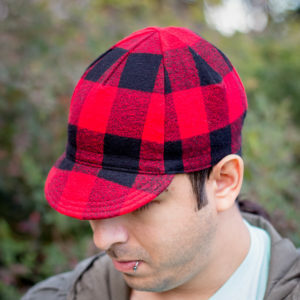 The cozy flannel fabric and knit ear flap (that can also flip up) will keep you nice and toasty! • The Winterberry winter cycling cap is the cap to grab as you head out into a blustery cold day with your bike. 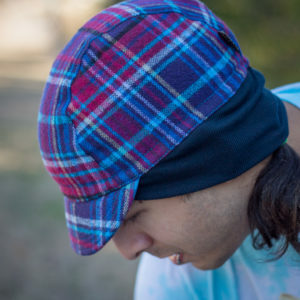 The cozy flannel fabric and knit ear flap (that can also flip up) will keep you nice and toasty! 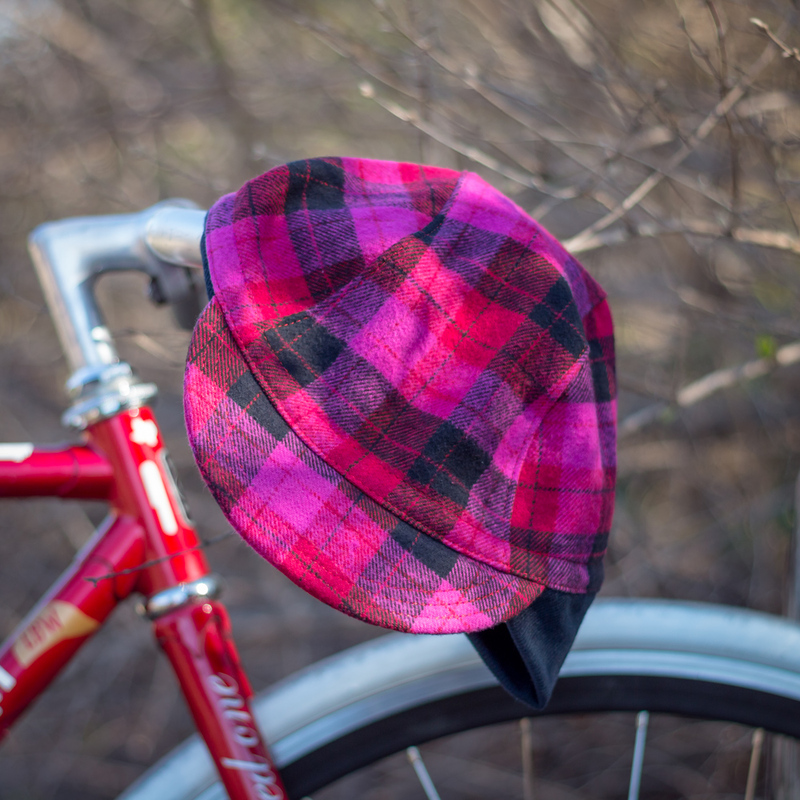 Our Lumberjack cycling cap is made to keep your noggin warm and keep you dapper! 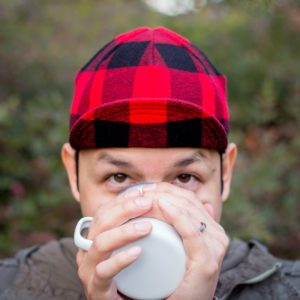 It’s made with a cozy brushed cotton flannel in a red and black buffalo plaid throughout the entire cap. 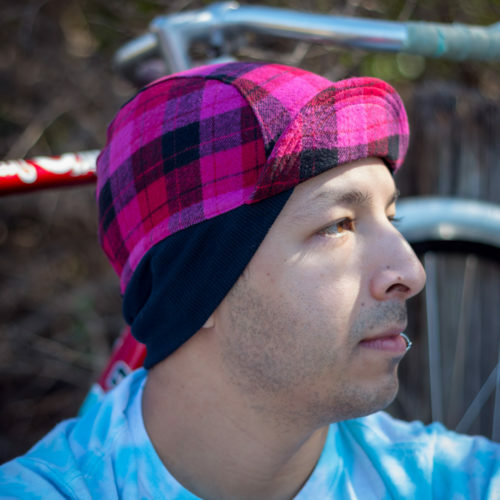 Our Aurora cycling cap is made to keep your noggin warm and keep you dapper! 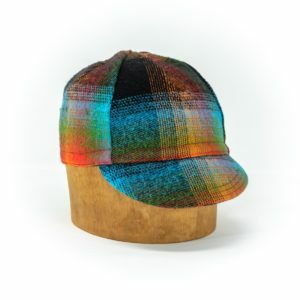 It’s made with a cozy brushed cotton plaid flannel in a rainbow of colors throughout the entire cap.